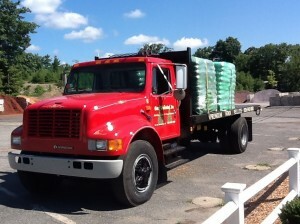 Mulch Delivery in Worcester MA, West of Boston, Pellet Delivery Worcester MA, Central MA. We deliver all over Central MA, check out our delivery zip codes and pricing. If you are outside these areas please call us for a custom delivery quote. We will now deliver 1 yard of any product to any delivery zone. All Deliveries must be paid for on or before arrival. We need to know about any and all delivery conditions that apply such as:low power lines, power Lines, gravel driveway, newly paved driveway, narrow road/Driveway or a steep upward hill. Please let office staff know of any conditions. We will make every best effort to get your product where you want it. Please be reasonable. Our driver’s do not back onto lawns. 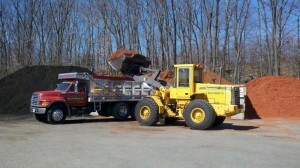 A waiver will need to be signed if the driver feels he can do so without damaging our equipment. Every driver is responsible for the equipment. The drivers will not do what they know they can not do. We do have a pallet jack for our wood pellet deliveries, this will make it easy for our drivers to push the pallet into you garage. We can not roll our pallet jacks on gravel, grass or dirt. If you will need them placed inside the garage please let office staff know. If ordering multiple products, please note extra delivery charges may occur. ** Note: Due to supply and demand and rising fuel costs, we reserve the right to adjust prices at anytime.